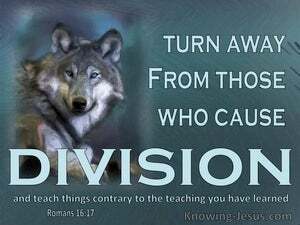 ﻿ Romans 16:17 Now I beg you, brothers, look out for those who are causing the divisions and occasions of stumbling, contrary to the doctrine which you learned, and turn away from them. Now I beseech you, brothers, watch out for those who make the divisions and the stumbling blocks, contrary to the doctrine that ye learned, and turn away from them. Now I urge you, brothers, watch out for those who are causing divisions and occasions for falling [away from God over matters] contrary to the teaching you have learned, and withdraw from them [i.e., stop listening to their false teaching]. Now I beseech you, brethren, to mark those who make divisions and cause offenses in opposition to the teaching which you have learned, and avoid them. Now, it is my desire, brothers, that you will take note of those who are causing division and trouble among you, quite against the teaching which was given to you: and keep away from them. I urge you, brethren, to take note of those who cause divisions and difficulties, contrary to the doctrine which you have learned; avoid them. Now I beseech you, brethren, mark those who cause divisions and revolts against the doctrine which you have learned; and avoid them. But I beseech you, brethren, to consider those who create divisions and occasions of falling, contrary to the doctrine which ye have learnt, and turn away from them. But I exhort you, brethren, to mark those who cause divisions and stumblings, contrary to the teaching which you have learned, and depart from them. I beg you, brothers, to be on the watch for those who introduce divisions and difficulties, in opposition to the instruction that you were given, and to avoid them. Now I beseech you, brethren, mark them who cause divisions and offences, contrary to the doctrine which ye have learned, and avoid them. And I beseech you, brethren, mark those who cause dissensions and offences outside of the doctrine which ye have learned, and avoid them. And I beseech you, brethren, to observe narrowly them having made divisions and scandals against the teaching which ye learned; and bend away from them. Now I beseech you, brethren, mark them who cause divisions and offenses contrary to the doctrine which you have learned; and avoid them. Now I exhort you, brothers, to look out for those who cause dissensions and temptations contrary to the teaching which you learned, and stay away from them. And I exhort you, brothers, to watch those making divisions and offenses contrary to the doctrine which you have learned, and avoid them. I beseech you, brethren: mark them which cause division, and give occasions of evil contrary to the doctrine which ye have learned; and avoid them. 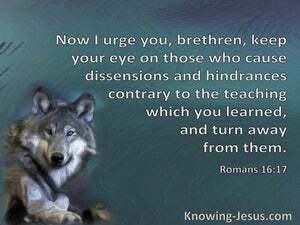 Brothers, I beg of you to keep your eye on those who stir up dissensions and put hindrances in your way, contrary to the doctrine which you have been taught. Avoid them. I exhort you, brothers, to keep watch of those who are causing the divisions among you, and occasions of stumbling, contrary to the teaching which you have learned. Now I urge you, brothers and sisters, to watch out for those who create dissensions and obstacles contrary to the teaching that you learned. Avoid them! But I exhort your brethren, to mark those who are causing divisions and offences, contrary to the doctrine which ye learned; and avoid them. Now I beseech you, brethren, keep a sharp eye over those who cause divisions and offences contrary to the doctrine ye have learned, and turn away from them. I urge you, Brothers, to be on your guard against people who, by disregarding the teaching which you received, cause divisions and create difficulties; dissociate yourselves from them. Now I beseech you, brethren, mark them who cause divisions and offenses, contrary to the doctrine which ye have learned; and avoid them. But I beseech you, brethren, to keep a watch on those who are causing the divisions among you, and are leading others into sin, in defiance of the instruction which you have received; and habitually to shun them. But I beg you, brothers, to keep on the lookout for those who stir up divisions and put hindrances in your way, in opposition to the instruction that you had, and always avoid them. Now I beseech you, brethren, to mark those who are causing the divisions and occasions of stumbling, contrary to the teaching which ye learned; and turn away from them. 16 Greet one another with a holy kiss. The assemblies of Christ greet you. 17 Now I beg you, brothers, look out for those who are causing the divisions and occasions of stumbling, contrary to the doctrine which you learned, and turn away from them. 18 For those who are such don't serve our Lord, Jesus Christ, but their own belly; and by their smooth and flattering speech, they deceive the hearts of the innocent. Now we command you, brothers, in the name of our Lord Jesus Christ, that you withdraw yourselves from every brother who walks in rebellion, and not after the tradition which they received from us. "Woe to the world because of occasions of stumbling! For it must be that the occasions come, but woe to that person through whom the occasion comes! He said to the disciples, "It is impossible that no occasions of stumbling should come, but woe to him through whom they come! Some men came down from Judea and taught the brothers, "Unless you are circumcised after the custom of Moses, you can't be saved." for you are still fleshly. For insofar as there is jealousy, strife, and factions among you, aren't you fleshly, and don't you walk in the ways of men? and there isn't another "good news." Only there are some who trouble you, and want to pervert the Good News of Christ. If any man doesn't obey our word in this letter, note that man, that you have no company with him, to the end that he may be ashamed. holding a form of godliness, but having denied its power. Turn away from these, also. But false prophets also arose among the people, as false teachers will also be among you, who will secretly bring in destructive heresies, denying even the Master who bought them, bringing on themselves swift destruction. They went out from us, but they didn't belong to us; for if they had belonged to us, they would have continued with us. But they left, that they might be revealed that none of them belong to us.